With Sage 200cloud you can choose from a range of modules available to suit your business to give you greater flexibility and control. Choose features to help manage your supply chain, control project costs, manage you manufacturing processes and management dashboards to help plan your business more strategically. From April 2019, new legislation will require VAT-registered business to submit their VAT returns digitally through commercial software. Making Tax Digital is a new government initiative to help businesses simplify their tax submissions. Making tax digital will provide a modern, digital service to help businesses get their tax right, reduce mistakes and avoid expensive compliance involvement. Sage 200cloud now has built in reports that will enable you to update and delete records quickly and easily – as well as being able to identify older data. Gone are the days where you search for data manually. Store your data securely on OneDrive through Microsoft Office 365, now connected to Sage 200cloud. 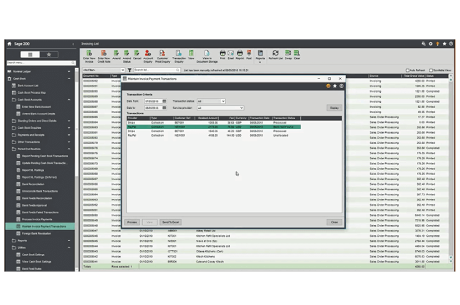 Sage 200 Financials manages the day-to-day running of a business, providing users control over costs and processes, drawing on information from Nominal Ledger, Cashbook, Sales and Purchasing Ledger. 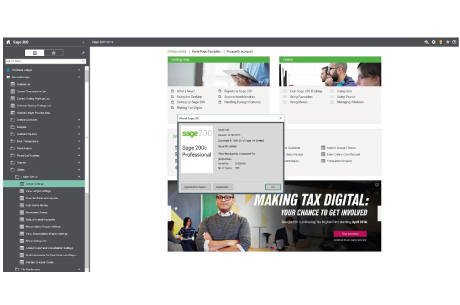 With the ability to track budgets, drill down into data, flexible accounting periods and nominal code structures Sage 200 is designed to suit your individual business needs. 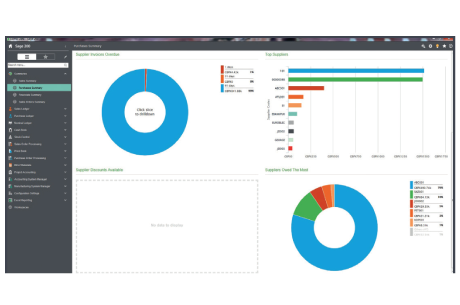 Sage 200 Financials ensures that you know the financial position of your company at any point in time to make critical business decisions. Have you ever struggled with customers paying late? Sage have partnered with GoCardless, the UK’s leading Direct Debit provider, so you can now get paid on time, every time, with automatic payment collections directly from within Sage 200cloud. 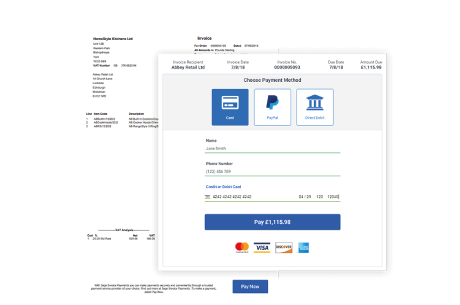 Invite customers to set up and import existing mandates and match them to Sage customer records, cancel payments or split a single invoice to collect payment in instalments. As your business grows, it can be harder to analyse the increasing amount of data to gain insights into how your business is performing. 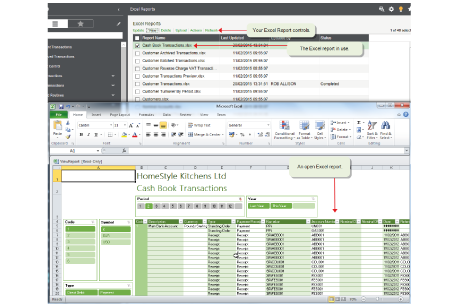 Sage 200cloud allows you to perform powerful business analysis with automatically formatted, neatly presented data within a single click, using Excel. Build and access reports on the go to boost your productivity and respond quickly to opportunities and get the insights you need to take your business to the next level. Commercials is designed to help you manage every element of your supply chain – from quotations, to price books: receiving and delivering goods, together with a complete inventory and stock management solution to help you optimise stock levels, keep down costs and deliver what your customers want. Commercials allows you to get the best deals from your suppliers by recording details of price history, purchase history for each stock item. 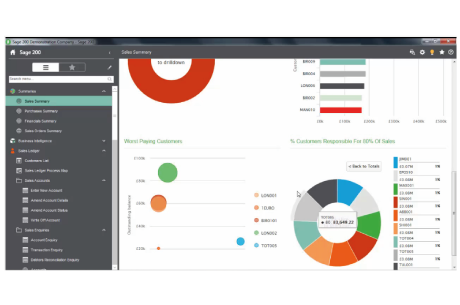 Business Intelligence (Sage BI) provides managers with clearly presented business information to plan strategically and identify key trends and patterns. 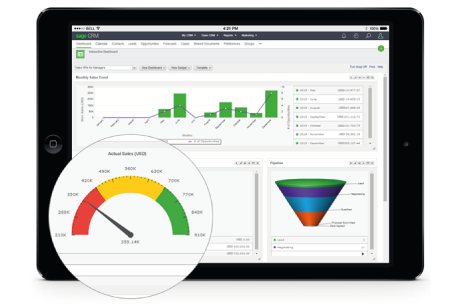 Complete management dashboards and analysis allows businesses to spot opportunities for innovation and identify improvements in productivity and growth in every area of your business. BI is easy to use, has flexible layout options and produces professional and aesthetic reports easily, allowing you to make quicker and better informed business decisions. 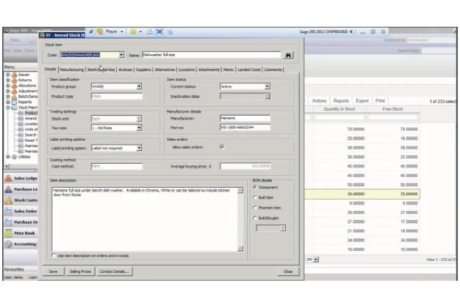 Modulr is now fully integrated with Sage 200cloud. Make payments faster, more accurately and securely. Salary and Supplier payments helps you adhere to your creditor obligations and gives you a stronger ability to forecast your cashflow. 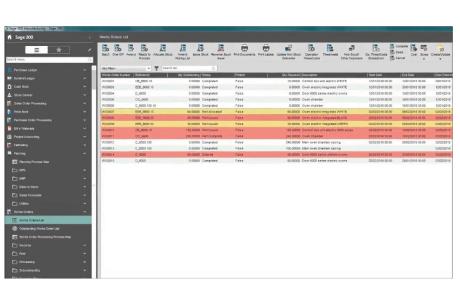 Automate your processes, eliminate batch files and deliver an always-on payment service. 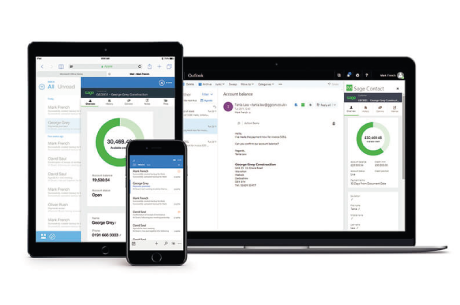 Microsoft Office 365 connects to Sage 200cloud allowing your teams to collaborate and share files and confirmation more easier than ever before using Microsoft’s cloud compliant environment. As files and data are no longer tied to a single computer, there is more choice for you to work remotely, saving you and your people time. Create more effective teams that can quickly and accurately keep track of finances and performance and act on opportunities direct from any smart device. Sage Project Accounting helps control your business costs and maximise your profits by understanding the detail of each and every project that you manage. Project Accounting helps to improves your customer satisfaction by ensuring accurate bills are delivered by capturing and allocating project costs, overheads and revenues. With Sage web time expenses (WTE) you can collect timesheets and expenses information online from anywhere. 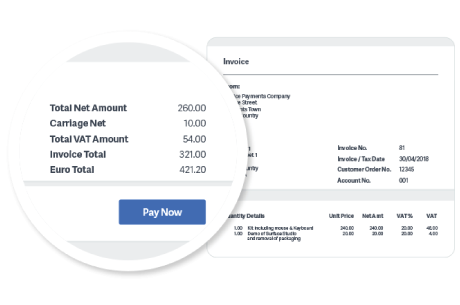 It is now easy to add a ‘Pay Now’ button to your invoices, allowing customers to make payments to you in just a few clicks. Spend less time allocating payments with automated transaction reconciliation, you can be assured that payments never spill into the valuable hours of your day. Sage CRM offers an out of the box solution with pre-configured functions for customer services, marketing and sales, enabling businesses to start improving their business relations straight away. Highly customisable for businesses with more complex business processes, workflows can be tailored to suit your business and your unique business processes. Sage Bill of Materials (BOM) provides control over the bill of materials process from beginning to end. The BOM module breaks down the manufacturing operation into easy to- access areas, including materials, labour, machines, operations and reporting. 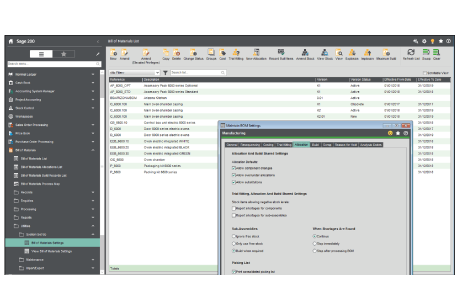 Sage BOM is ideal for those companies that are involved in light assembly and do not require the full complexity of the Sage Manufacturing module. 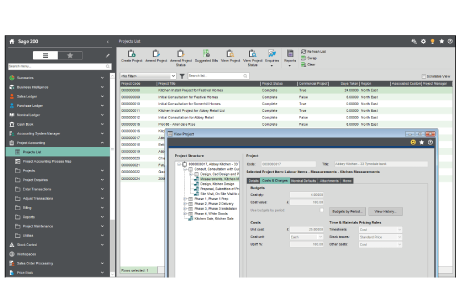 BOM integrates directly with the Sage 200 stock control and nominal ledger modules but can also we used with Sage 200 Manufacturing modules. Full planning, order processing, and materials and stock management to standardise and streamline production scheduling, so you can co-ordinate your distribution channels and get automated reports. Support assembly line, repackage bulk items, resource plan, and schedule work and materials. Reduce costs and delivery times, helping you improve productivity by monitoring production processes and tracking components through the whole manufacturing cycle. Manage your accounts and customers, manufacturing, supply chain, business intelligence, and more, all in one solution, on the go. Sage 200cloud uses the power and productivity of the desktop, with the freedom and control of smart, secure cloud & mobile access. 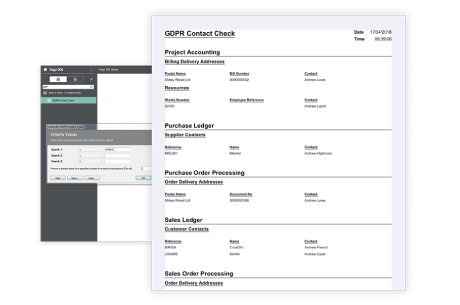 Built in functionality to help you meet GDPR obligations by enabling you to update and delete records easily. Also compatible with HMRC MTD pilot.